One of the findings was carried out thanks to ESO’s ALMA (Atacama Large Millimeter/submillimeter Array) radio telescope and was published in the journal “Nature”. It was used to analyze the protoplanetary disk around the star MWC 480, which has an estimated age of just one million years. It has a mass approximately twice that of the Sun and has a distance of 455 light years from Earth. The planetary system of the star MWC 480 is just beginning to form from a disk of dust around it and for this reason is very interesting. The observations with ALMA allowed to detect the presence of methyl cyanide and hydrogen cyanide in the outer regions of the disk. That’s the area analogous to the Kuiper Belt in the Sun’s Solar System, the area beyond Neptune where there are icy planetesimals, the primordial objects at the base of the formation of the planets, and comets. Studies of comets already provided evidence that in the nebula that gave birth to the Sun and its planet there were a lot of water and organic molecules. The discovery of complex molecules in large quantities in a newborn solar system provide a new proof that this type of chemistry exists elsewhere in the universe as well. A very important element of this research is the amount of those molecules, really huge. They are much more abundant in the system MWC 480 than in interstellar clouds. This means that at least a good part of them were formed together with that solar system. 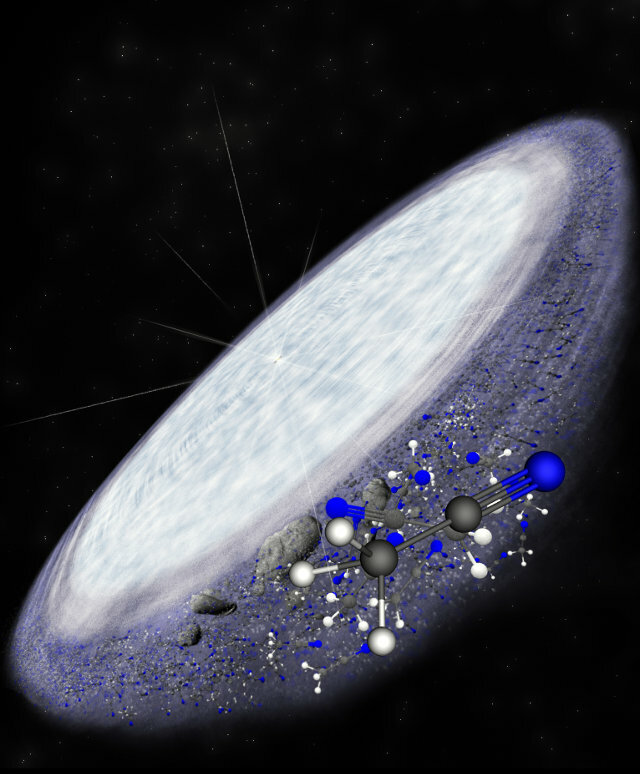 Another study published in the journal “Monthly Notices of the Royal Astronomical Society” concerns the discovery of another organic molecule, formamide, in five protostellar clouds. This molecule is important because at the base of the production of sugars, carbohydrates, amino acids and nucleic acids. An international team used the telescope 30 meters in diameter of IRAM (Institut de Radioastronomie Millimétrique) on Pico Veleta in the Sierra Nevada, part of the ASAI (Astrochemical Surveys At IRAM) project. One of the aims of this project is exactly to study the genesis and evolution of pre-biotic molecules in the formation of a Sun-like star and its planetary system. According to the researchers, formamide gets formed in cold environments on icy mantles of dust and then sublimate into gas when the protostar cause an increase in temperature in the cloud of gas and dust in which it was born. The formamide thus formed remains attached to dust particles until the temperature is high enough to cause its sublimation. Those are important discoveries that combine astronomy and biochemistry to understand how organic molecules at the base of life may have formed in space. Recently, a group of researchers announced that they created some bases of RNA and DNA starting from molecules found in space. All this research are helping to explain how life on Earth was born and to give us an idea of ​​how widespread it can be in the universe.